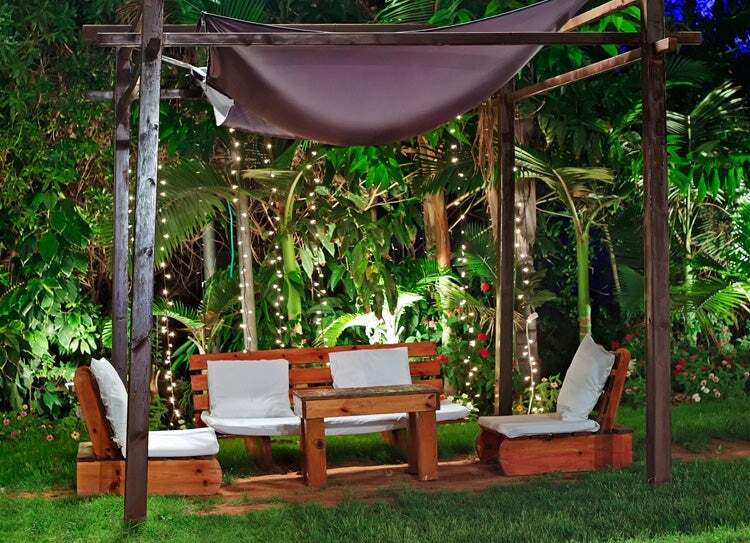 Add enchantment to your garden with nighttime lighting. With the right lighting techniques you can create almost any effect you like, from dramatic and theatrical to romantic, mysterious, subtle, or subdued. Create your desired effect with the following tips from illumination designers. If you have trees on your property, you can create the illusion of moonlight (even on cloudy nights). Point floodlights downward from high in the trees for this effect. It is particularly effective if the trees have a lacy canopy that will cast an intriguing shadow. In large spaces, downlights should be at least twenty-five feet off the ground. If you have tall trees, it’s worthwhile to hire an arborist to place the light fixtures as high as fifty-five feet. Avoid having a large lower limb in the way of the light beam as the chunky shadow it casts is not as appealing as a lacy pattern of leaves and small branches. 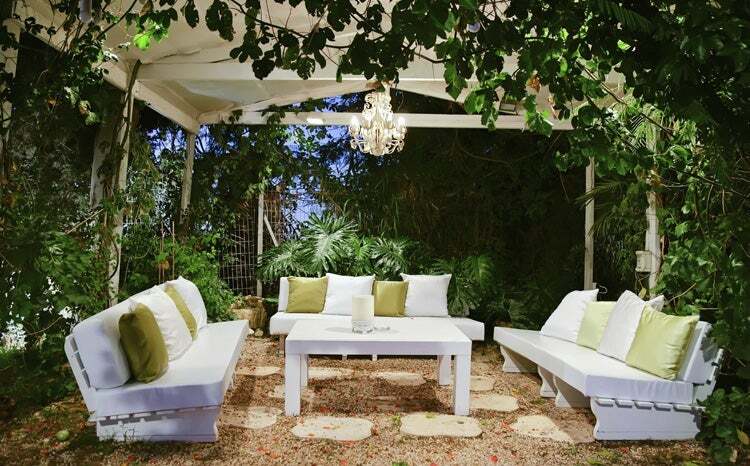 Choose fixtures that provide the maximum light spread for an even wash of light over the ground. Because downlighting from a high source creates even light, it is an ideal way to illumine paths and steps instead of the traditional groundlevel path lights. If properly placed, the high light source is less obtrusive than pathway lights and sheds a soft, natural looking light on the area. Light focused up from the ground on trees and walls highlights bark and foliage, accentuating textures and forms. Leaves with pale undersides appear to sparkle when they are lit from below. When uplighting a tree canopy, be sure to include the tree trunk in the light beam to avoid the uncomfortable sense of a form floating above the ground. Different trees benefit from different uplighting approaches. For a tree with a tall, willowy form, fine-textured foliage and an open canopy, use a minimum of three fixtures placed evenly around the tree to show off its full shape. For a conical evergreen, position the light fixture back far enough from the plant and set the angle so the entire side of the tree is washed with light. For trees with narrow, fastigiate forms, place a narrow-beam light directly at the base and aim it straight up (or at a slight angle) so the light grazes the surface of the plant, showing off the foliage texture. Uplighting larger trees around the perimeter of a garden room helps establish the “walls” and “ceiling” of the space. If these trees are close to the entertaining area, downlight from the same trees to provide a natural looking, uniform light over the space. When a tree is lit with both uplighting and downlighting, the combination can be magical. The tree is highlighted by the beam of light focused along its trunk and up into its branches, while at the same time the general area is softly lit, as if bathed in the glow of the moon. Shine a light from behind to make an interesting object stand out in silhouette. Use this lighting technique on a tree or shrub that has a simple, striking form that is well defined in an outline. The plant will show up best if it is near a fence or wall or in the open where there aren’t other forms to distract from the silhouette. When you illumine a building or object from the side, you increase the awareness of textures because of the shadows created by the angle of light. In contrast, when you place a fixture directly in front, but some distance away from the subject, you get an even wash of light over the entire surface. Generally when you uplight a sculpture, you want the light source to be back from the object so the light covers it evenly. Otherwise you’ll get dark shadows created by the sharp angle of the light. Experiment with the fixture location until you find the best solution. In some cases, such as when the foliage texture or pattern behind a sculpture adds to the drama of the setting, a combination of uplight behind as well as a spotlight in front may be the answer. 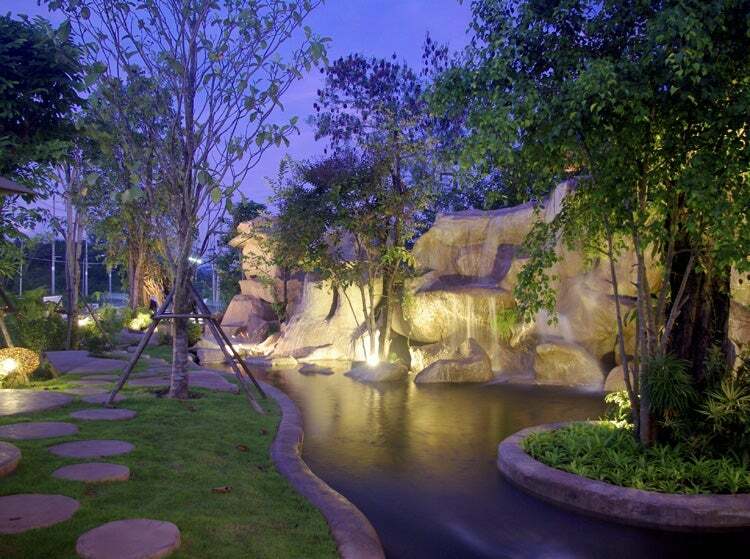 By effectively lighting your garden, you extend the hours of pleasure the space provides. From inside or out, your garden is there for you to see and enjoy.